My next blog will be on my research trip to Stonehenge, but while I write that, I thought you might be interested in this short scene that was written for a writing class, we had to write about an argument. Conflict is something that drives plot, as it pushes people into action, I had a whole story in my head about this piece. Simon gave a satisfied sigh, leaning back in the chair. Patting his now slightly distended stomach he belched softly. From across the immaculately appointed dining table, Amy gave him a disapproving look. Simon gave her his best cheeky grin and her stern demeanour cracked, a stunning, indulgent smile spreading across her face. Simon raised her hand and kissed the palm, watching as her beautiful blue eyes glazed a little in lust. He leant forward, nipping, licking and kissing gently up the inside of her wrist. She shuddered, her other hand running fingers through his hair. Simon reached the crook of her arm and stopped raising his eyes to her half-closed languid blue gaze and smiled. There was just enough suggestion to the comment to bring a sultry smile to Amy’s face. Simon chuckled. Amy shook herself and stood, stacking the plates to take into the kitchen. Simon caught her hands, enforcing stillness. With a puzzled look, Amy sat again. Amy jumped up and flung her arms around his neck. “Simon that’s brilliant!” She squealed in his ear. Simon hugged her slim frame. Amy froze. Pulling away from him, her arms crossing her stomach, holding herself, she stared at him. Simon registered the shock. Amy’s shocked look morphed into something Simon had not expected. Fear flooded her eyes. Stunned, Simon felt the situation shifting, in all the months of planning, he had never imagined for one moment that Amy wouldn’t want to come. Simon felt anger surface, this was a huge opportunity for him, something he’d worked really hard for, Amy should be delighted. Simon stood up so quickly he knocked over the delicate dining chair; Amy cringed at the noise as it hit the polished dark wood floor. With a sharp inhale of breath Amy grasping her hands over her heart, tears standing out in her eyes. She struggled to get herself under control, to speak around the obvious lump in her throat. “My art lessons are…” she whispered. “I’m pretty sure they give art classes in New York, Amy,” Simon interrupted, imperiously. Regretting his tone as Amy seemed to fold further into herself. “My family…. My mother…” Little more than a breath, the soft utterance had started the tears falling. “I’m not going. You are going to have to decide once and for all, us or your job.” Simon could hear the steel in the soft voiced ultimatum. When he didn’t respond immediately, the tears started in earnest and turning on her heel Amy fled the room. Simon righted the chair and sat heavily. It was then he noticed the small gift near his wine glass. Wondering morosely if it would be the last anniversary present Amy ever gave him, Simon opened the box. Inside was a strange plastic tube, a small screen embedded in it. The small screen had the word ‘Positive’ standing proud on it, the image of a little digital baby next to it. It took a full minute for the significance of what he held in his hand to register. Then it took less than a second for the entire world to turn on its head. “Oh Amy…” he murmured, his anger evaporating. 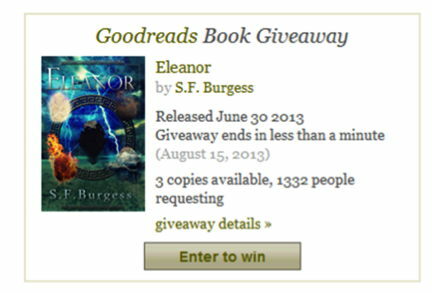 My first ever Goodreads (Goodreads Giveaways) ‘Giveaway’ competition has just reached its conclusion and I have to admit I was stunned by the response. We ran the competition, giving three signed books away (with limited edition bookmarks) over a month. 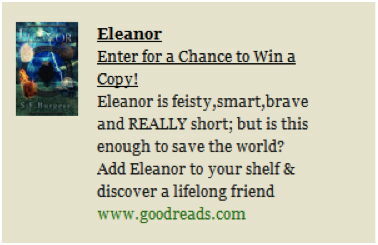 We opened it up to UK, US and Canadian Goodreads members, we even splurged on a bit of marketing and paid for a ‘pay-by-click’ advertising campaign on the Goodreads site that included a link to the giveaway. This pay-by-click adverting allows you to set how much you are willing to pay for each click i.e. 10 cents, 20 cents, 50 cents etc., and the more you are willing to pay the more often your advert will be seen and therefore, hopefully the more people you will get the cover of your book in front of. We started the campaign off on 50 cent a click. As we began to run out of money, we dropped the click price down to 10 cents. As you can see, from the stats, there were approximately 1200 views for every one click, a click through rate over all, of 0.08%, which isn’t brilliant. Although at one point it did get as high as 0.13%! The algorithms that control how often your ad is shown are known only to Goodreads, but it seems the more the advert is clicked during the day, the more it is shown the more chance it has of being clicked. Of course, being a bit gung-ho we set all this up before we read the advice (How to Run a Goodreads Giveaway with Maximal Results – link currently down) on how to do it! Having read this article we opened the competition up to every country covered on Goodreads and the entry numbers started raising. By the end of the competition 1332 people had entered. 1332 people the majority of whom I didn’t know had had my book cover in front of them, had perhaps read the blurb (thank you Jon and Laura! 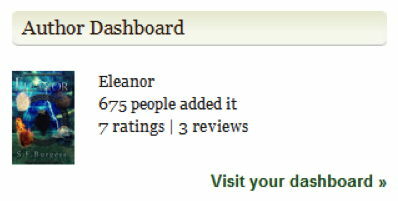 ), but, more telling over 600 people added Eleanor to their ‘To-Read-List’, if only 10% of these people follow through on this, I’d still be a VERY happy bunny. I can’t BEGIN to tell you the excitement of watching the entry numbers raise as the competition came to a close, towards the end we had about 2 people a minute entering! The 1332 entries I got put me VERY high on Goodreads ‘Most Requested’, which I think also helped with getting further enties. Once the competition ended, Goodreads promptly sent me the details of the winners they had selected, one in Denmark, one in Belgium and one in Italy. I immediately sent out ‘Friend’ requests with a congratulatory message attached through Goodreads. I heard back from two of the winners immediately and was delighted by how happy they appeared to be at winning. At this moment, I have had my friend request accepted by the third winner, but I am yet to receive a message response. Yesterday I packed up my three personally signed giveaways and sent them off, hoping that good reviews came of it. Whatever the outcome, the number of people who have seen my book and shown an interest (by adding it to their ‘To-read-list’) makes the giveaway worth the money we spent on it. I think, once I have a few more reviews, I will be running another one! After the competition finished, I received, (through the book website and Goodreads) requests from people for a free paperback copy of the book in return for a review. Being unsure about this, we did a little research and discovered the following article (How to Beat the Giveaway Scammers). So in the future anyone asking for a paperback copy (which costs me $20 every time I send one out!) will be offered a gifted Amazon.com or iTunes version and once they have posted the review, I will be happy to send them a paper copy. If they wish to sell it on e-bay at this point, then fine, as it would mean I got my review and yet another person got to read the book :-), a win-win situation. So I’m a published author. (I have to keep reminding myself, because I still can’t believe it!). If I’m honest I’m not sure what I expected, I knew, with no marketing budget, I was going to have to work hard to push the word of my book out, but it didn’t cross my mind that getting ‘Eleanor’ in front of people, into their awareness would be as hard, if not harder than writing the book itself. After all, writing comes naturally, marketing…? Not so much. I’ve done a bit of research and one point stood out loud and clear. Publishing a book in any way, be that with a traditional publisher or self publishing required the author to at least get to grips with the basics of marketing and self-promotion. Hugh Howey (my guru in such matters) says that he didn’t market ‘Wool’, that it ‘just happened’, but his talent is quite a bit more prodigious than mine, so I’m thinking a little marketing would be a good idea. I’ve got some good ratings on Amazon, which is brilliant and as of this moment 69 people liking my Facebook page (www.facebook.com/mydren), but on zero budget I wasn’t too sure where to go next. Then my amazing husband once again came to the rescue and suggested Goodreads (http://www.goodreads.com/). I’d never heard of this website, and I have to admit to feeling VERY foolish when I went on the site and realised how cool it was. I had great fun ticking off books I’d read. Then I added my own book and put a ‘giveaway’ on for a month. I offered three signed books (with bookmarks) and made the giveaway available to as many countries as possible. So far I’ve had 234 people enter the giveaway, so I’m hopeful a few of them will also read the book and post reviews. If nothing else it’s putting my book in front of hundreds of people ☺ so a good result. I know my journey is only just beginning, but I’m fairly sure I’m heading in the right direction. Look out for our first Blog posting, coming soon!.